‘The Virtual Assist’ is the leading Animation and VFX Blog founded and owned by Amit Mozar. The Virtual Assist provides latest updates and news of Animation and VFX (Visual Effects) industry including jobs, software and hardware, technology, events, seminars, online contests, webinars, mergers and acquisitions, making of, behind the scenes, Virtual Reality (VR), technical interviews, exclusive original content and other related useful information of 3D / CGI world. Amit Mozar is founder, owner and editor of The Virtual Assist. He is Arts and Media professional with 11+ years of experience and knowledge in various essential verticals of Animation, VFX, Educational operations, Editorial, Business and Integrated social media marketing. Expertise ranges from being an Artist, Trainer, Writer to Management functions. He believes in the mantra of ‘Constant Learning’. That is – the more you know, the more you live !!! During corporate training, Mind Mapping technique is used extensively. It enhances faster and better knowledge grasping through visually engaging format. Theory is explained via Mind Mapping, followed by practical sessions using the software. So, complete understanding goes seamlessly. All these mind maps are shared to trainees for their future reference. 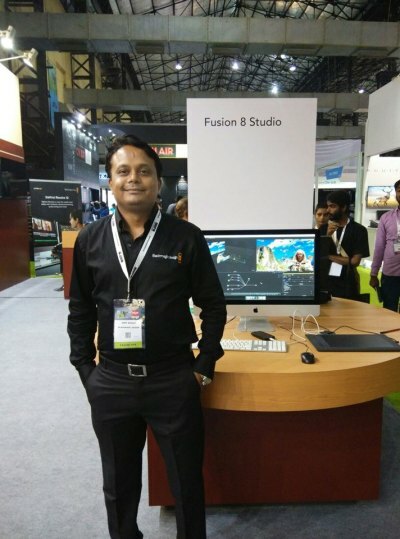 Amit Mozar represented internationally acclaimed broadcast and video production manufacturer company Blackmagic Design at Broadcast India Show 2015 as Fusion Demo Artist. He conducted live sessions of Fusion 8.0 for the attendees of the show. His responsibilities were to increase the brand awareness, solving the queries of Fusion and related VFX questions and facilitate the audience with industry knowledge. On an International frontier, he has given credit for Project and Source Footage courtesy by the VFX Maestro Steve Wright in his upcoming Digital Compositing book. Out of this digital life, he enjoys being with his family and friends. Loves blogging, traveling, reading and photography.